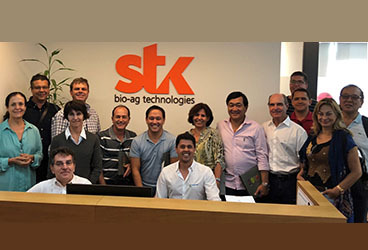 STK bio-ag technologies, a leading company in the development and marketing of botanical-based solutions, hosted today a technical visit of brazilian banana growers to learn more about the positive effects of botanicals on banana and its added benefits for crop protection. The visit began at STK HQs, followed by a 5 day technical tour throughout Israel to learn from various farms, banana specialists and listen to professional lectures in the industry. The VIP delegation of 15 visitors composed by producers, consultants and managers of associations covering all regions of Banana production in Brazil, visited as part of study tour the premises of STK HQs in Israel. The growers and consultants who will take part in this trip, represent more than 15,000 hectares of banana and the associations and cooperatives represent more than 80,000 hectares. The vist included and extensive tour of the the STK lab, during which the delegation was exposed to the company’s scientific and technological approach to researching and developing botanical-based solutions, as well as the exacting quality control practices employed in producing consistently effective commercial-grade formulations.